Liam O'Neill heading for Pastures New Liam has been invited to exhibit his new paintings in San Francisco during Saint Patrick's Week. 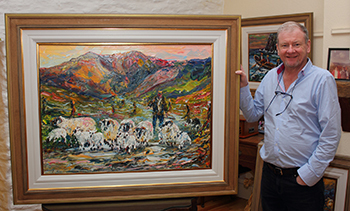 Liam O'Neill with his oil painting "Pastures New". Liam in the Studio with some of the portraits ready to go to the Oriel Gallery. 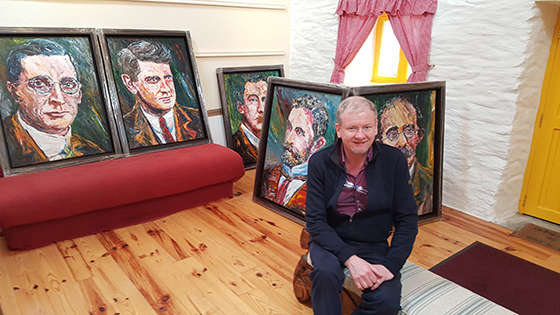 As part of Ireland's centenary celebrations, Liam O'Neill will exhibit a special collection of portraits and landscapes at the Irish Consulate in New York on Thursday 26th May. The collection will be previewed at The Shelbourne Hotel, Dublin, on Thursday 21st of April 2016. To officially announce the New York exhibition, Liam O'Neill will be the special guest at the Ireland Chamber of Commerce USA St. Patrick's Day Breakfast at the Waldorf Astoria in New York on 17th March 2016. Liam O'Neill is amongst Ireland's most talented contemporary artists. He is a self-taught painter, who, over the last twenty years, has shown work at The Royal Hibernian Academy, The Oireachtas, The National Portrait Exhibition and The Claremorris Open. His paintings are collected nationally and internationally. Over the course of his career, Liam O'Neill has developed a reputation as one of the finest portrayers of rural life and his painterly interest in the lives and environs of West Kerry has become his hallmark. "...overwhelmingly powerful images of landscapes and people..."
Portraiture that leaves its subject "immortalised on canvas." LIAM O’NEILL, MASTER PORTRAIT PAINTER FROM IRELAND GIVES WORKSHOP - As part of the Kennedy Center’s 2016 Irish Festival, Master Portrait Painter, Liam O’Neill conducted a workshop for students at Public School 111 in Manhattan. Liam O'Neill exhibiting at the The London Irish Art Exhibition. January 2015.